Seventy-five per cent of Australia’s land mass is regarded as Rangelands. Whilst often recognised by many Australian’s as “the Outback” the name Rangelands is an accepted term used around the world to describe the regions of low rainfall and highly variable climate of arid and semi-arid regions. Our rangelands contain a wealth of biodiversity including a total of 1800 types of plants and 605 vertebrate animals currently identified. The term “Rangelands” first came into use in the 1600s in the United Kingdom, became more commonly recognised in the United States from around the 1800s and has now been adopted world wide to explain the various land types found in the arid and semi-arid zones of the world. These many different types of rangelands together for the largest part of the earth’s land surface – approximately 70% (excluding Antarctica). In Western Australia the rangelands cover 87 per cent of the state’s 2.5 million square kilometres, and include all but the south west of the state. Approximately 980,000 sq. km is pastoral leasehold. Most of the WA rangelands are flat to undulating. 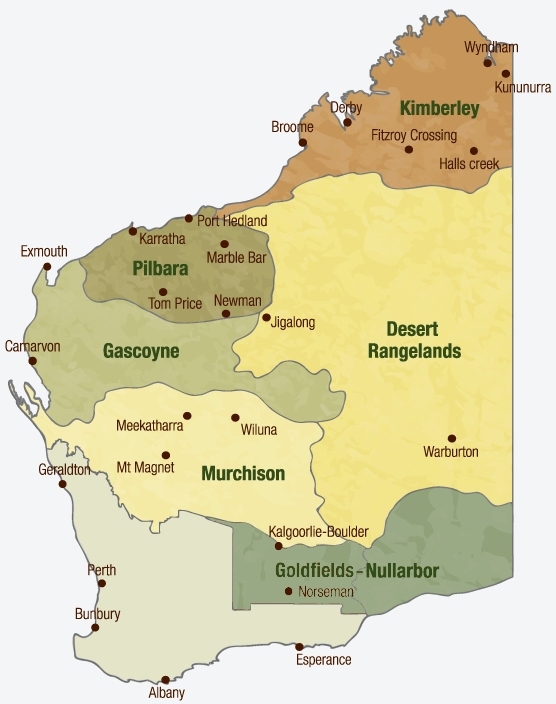 There are 20 bioregions wholly or partly within the rangelands portion of WA. Vegetation types range from tussock grasslands and shrublands to woodlands, but also include patches of monsoonal forests in the north of the state. Australia's rangelands support a significant amount of the country's valuable mining industry. In 2011-12, WA's mineral and petroleum production was valued at more than $106 billion. Tourism is also a growing enterprise with the value of the WA tourism industry reaching $5.97 billion (gross value added) in 2010-11. Pastoralism is the most dominant land use across 45 per cent of WA’s rangelands, with a greater proportion of sheep in the south and beef cattle in the north. The total gross value of agriculture in the 'rangelands' NRM region of WA (in 2010-11) was $476.2 million which consisted of $108.7 million in horticulture, $26.6 million in sheep and lambs ($14.0 million livestock and $12.6 million wool), $330.4 million in cattle and calves (livestock) and $4.8 million in goats (livestock). (Source: 2010-11 ABS Commodities for Rangelands NRM). the north-west shelf and diamonds in the Kimberley. On a National Scale, through initiatives such as ‘Caring for Our Country’ the Australian Government’s Department of Agriculture, Fisheries and Forestry (DAFF) is working to achieve sustainable land management in the rangelands.